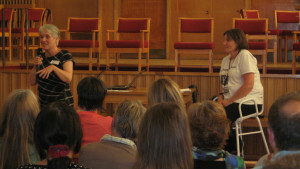 On the 13th October, there was a Music in Mind event in Bath. Music in Mind is a special evening, raising awareness and funds for mental health charities for World Mental Health Day. A single called “More than That” was released this year to raise mental health awareness and reduce stigma. The More Than That single is on sale from Bandcamp and iTunes and costs 79p to download. You can also watch the video on YouTube here. 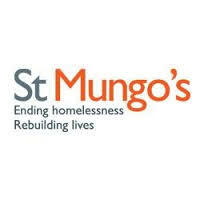 We are very privileged to be one of the recipients this year of funds raised by the single and event, and we would like to thank everyone who took part in the event. We were very kindly presented with £250, all of which will go towards helping carers. Also, on the 18th of November, Mary appeared on Radio Bristol and did a really good interview to promote both of these documents, as we are hoping to get as many carers as possible to know about the charter. You can listen to the radio interview here and links to the Carers’ Charter and the Carers’ Charter Explained are here and here. Please spread the word, as empowering carers is paramount to improving the way the AWP works with carers. Kate Morton from Bath MIND came to talk about what they offer to people with mental health difficulties. Really good talk. We also had a check-in of course, and refreshments. A great get-together. Many thanks to Anne-Marie for coming and offering shoulder and neck massages. People really enjoyed them. A monumental day for carers, as commissioners for mental health services in BANES came to talk to carers for input into the mental health review of services in BANES. I would like to think KS2Bath were instrumental in making this happen. Carers gave their experiences of services offered to their loved ones, where they felt there were gaps and ideas on how to give better support. 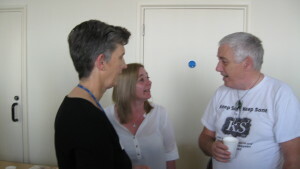 Many thanks to Basil and Daisy for taking the time to come and talk directly with carers. Of course coffee, cake and “catch up”! group involved and want to get a strong response from carers. A good meeting with Val from Talking Therapies giving a talk on her service, which is open to anyone to self-refer. Of course we had coffee, cake and “catch up”! A big thanks must be given to Tanya who makes cakes for each of our meetings, and very nice they are too! We had a BBQ in Mulberry House for carers and service users, with lots of burgers, sausages and salad. A lovely event in a beautiful garden with the sun shining, 35 people came. Many thanks to Lee, Ralph and Mark for all the help setting up and cooking the food. Ian Reid, a Senior practitioner from the AWP, came to talk about his role within the AWP, particularly with complaints, and to introduce himself as the person who will be working with KS2Bath in the future. A sad goodbye to Gina who is retiring and leaving KS2Bath! Wishing her well with many thanks for all the work she has done for carers and for our group. Another social event as our intended speaker was unable to attend. Good discussions again about future events and involvement, and of course coffee, cake and “catch up”! A social event with a lot of discussion about training for carers, as we are in the process of setting this up and want input for content. Of course coffee, cake and “catch up” too! Back in the newly refurbished Carers Centre. Lee Rawlings, AWP Involvement Co-ordinator for BANES, came to talk about carer involvement with AWP in BANES. Anyone who cares for someone who is involved with AWP and is interested in getting involved themselves, let me know and I can pass on Lee’s contact details. We had a social evening at The Bubble in Bath for Valentines day. Food for Thought did some delicious food for what was a lovely relaxing event. Julie very kindly provided a raffle which raised £25 for the group. Many thanks to Food for Thought and Julie in setting up a great event! Post Christmas meeting at The Bubble in Bath as Carers centre was closed. Many thanks to all who ventured out in the cold. Very good to have a catch up of course with coffee and cake! Our AGM took place and all committee members re-elected for another year. We went through our achievments from getting funding, to The Carers Charter. We finished off with a Christmas party with lots of lovely food and general chit chat. Here is hoping for a lovely Christmas and peaceful New Year! 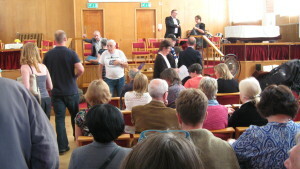 You can view our AGM report here. A busy meeting! The new constitution for KS2 Bath was unanimously voted in by the 14 people that attended. Part of the new constitution states that members must the new code of conduct and confidentiality forms. If you haven’t yet signed, let me know and I will get the forms to you. Anne-Marie drew the raffle that she has been doing to raise money for KS2 Bath. Anne-Marie worked extremely hard and raised nearly £200, and we would like to say a big “thank you” to her for all her hard work! 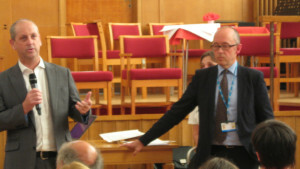 Dan Badman, the new Head of Quality for the AWP in BANES, also came to listen to, and talk to, carers. Many thanks to him! 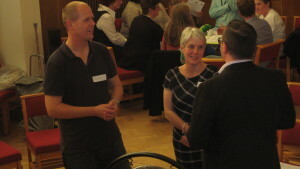 Liz Richards, managing director of the BANES AWP came along to talk to carers and listen to any issues that carers have. Liz talked about the changes in BANES Community Services in light of Virgin winning the bid in BANES for Community Services. KS2 Bath will be meeting Virgin soon to discuss carers’ issues with them. Many thanks to Liz for coming. We also had the usual coffee, cake and chat! We had a social evening tonight, with food, coffee and chat. Many thanks to everyone who bought food. Phoebe played the ukulele and we had a sing-song too! 25 people came and we all had a great time! Linda Hutchinson, the carer experience lead for the AWP, and a member from the research team of the AWP came to our group to meet carers and ask for our input into some research they are doing. 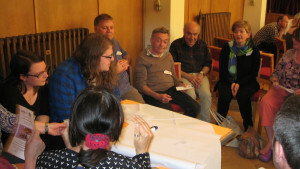 Our group gave some great feedback, and I think we gave them some insight into carers’ issues. Coffee and chat was also had. Judith from Food For Thought, a MIND group, came and gave a talk. Food For Thought is a group for anyone affected by mental health issues. They prepare and cook food to share together, and they also produce amazing food for events! I am working with Judith to set up an event for carers and service users to prepare and share a meal together, so watch this space! Many thanks to Judith for the talk and the amazing crumble she brought with her! We also had coffee and chat tonight. A great evening. The mayor of Bath, Will Sandry, came to talk to us! During his tenure he has been focusing on mental health issues, and he came and talked to carers and service users. Will is a lovely man who talks openly about his personal situation to help de-stigmatise mental health and improve services. Many thanks to Will for an interesting night. Ursula James from Talking Therapies did a talk on CBT tonight, and gave a lot of insight into the different therapies offered by them. Ursula has given a lot of time to our group, coming and talking individually with carers. She will soon be moving on to a different job, and I would like to say a big thank you for all she has done for our group, and wish her well for the future. Members of KS2, New Hope and AWP involvees came together for a post Xmas meal. The food provided by Food for Thought was delicious and we had 34 people attend. What a great social event , really enjoyable. Many thanks to all who made this a great evening especially Julie who provided a raffle and raised £50 for our group- many thanks to her! Many thanks to all who came tonight in this terrible weather. A great meeting lots of chat and ideas for AWP carers pack and things to do for the year. Of course we had coffee,cake and catch up! A great meeting with really good turnout for such a cold day. Kate Morton from Bath MIND came to talk about their 5 year plan and there was a lively discussion. MIND have a lot of things going on over the next few years developing peer support, advocacy to name a few.